Join Brad Halm to learn about the right planting schcedule for your home garden on Wednesday, March 16th from 6:30-7:30 at the Education Station at Twispworks. A $5-$10 donation is suggested. Brad is an experienced organic farmer, garden designer, entrepreneur, and author. He got started growing food in a small vegetable garden at the Homestead, an experiential living option at Denison University. His interest piqued, he spent several years working on and then managing CSA farms around the mid-western US, growing his skills and forging a connection with growing food as a way of life. In 2007, he moved to Seattle to co-found the Seattle Urban Farm Company, an acclaimed business that designs, installs, and maintains urban farms and edible landscapes. 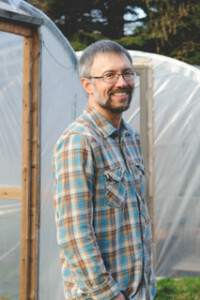 Since then, Brad has designed and installed hundreds of residential and commercial edible gardens, developed a wholesale organic farm supplying Seattle area restaurants, and lectures regularly on organic gardening skills. He currently applies his skills at Bluebird Grain Farms, an organic ancient grains producer in Winthrop, Washington. He’s co-authored two books: Food Grown Right, In Your Backyard (The Mountaineers 2012) and High-Yield Vegetable Gardening (Storey 2015), and contributed an essay to Greenhorns: 50 Dispatches from the New Farmers’ Movement (Storey 2012). He believes strongly in adding to the body of farming knowledge, and hopes to inspire new farmers and gardeners to start their own sustainable food businesses.